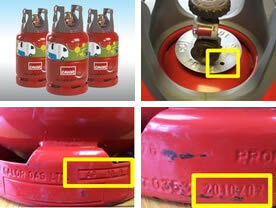 CalorLite gas cylinders have been recalled by Calor on safety grounds. Affected are 170,000 6kg CalorLite cylinders manufactured from 2008 to 2011. Fortunately there have been no gas leak incidents reported that involve the public, but Calor is urging all caravan owners to check the gas bottles on board urgently. This is because the firm is worried that gas could escape from these cylinders due to a ‘potential material defect’ that might deteriorate over time. The latest CalorLite cylinders are safe, and it is just CalorLite cylinders made in 2008, 2009, 2010 and 2011. So if you have a 6kg container made in any of those years, please take it back to a CalorLite stockist as soon as possible to claim your free replacement. Calor has more than 2,100 stockists in the UK, so your cylinder swap shouldn’t be too difficult. Go to the Calor website to find your nearest Calor stockist. Just click the ‘Calor Lite Stockist’ box and put in your current location and a selection of stockists will pop up on your screen, along with their distance from you, and the points plotted on a useful map. Even if your 6kg CalorLite cylinder is completely empty, your nearest Calor retailer will replace it for free with a safe 6kg CalorLite cylinder. So do check your caravan fuel locker and shed and make sure you get swapping, if you have one of the 2008-2011 containers. Dates of manufacture are stamped onto the cylinders. So to find out if yours is one of the recalled products, first see if you can read the writing stamped low down at the base, around the circumference. It should read ‘Property of Calor Gas Ltd’ and then give two letters, the last two numbers of the year it was made, then a letter. So if your cylinder has AP 10 B, for instance, that means it was made in 2010 and is part of the recall. Don’t forget, 08, 09, 10 and 11 are the years affected. Also at the base of the cylinder you will find more letters and numbers. It might say 2009/09, for instance, i.e. September 2009. At the top of the container, there’s a shiny metal disc around the valve, which looks a bit like a dog’s collar name disc. This is the cylinder tare disc. If your 6kg CalorLite cylinder has already been recalled, tested and pronounced safe for use, then you will see a punched hole in the tare disc. It’s just a 5.5mm diameter hole, but it’s good news if you see that, since you won’t have to replace your cylinder, even if it is dated 2008, 2009, 2010 or 2011. The recall notice was issued on 15 September 2014, If you have any doubts or questions about the September 2014 CalorLite cylinder recall, please ring the special helpline on 0800 783 4141.